For those who don't know, Extra Life is a videogame-based charitable organization founded in 2008. It was a way to honor a young lady named Victoria Enmon who had unfortunately lost her battle to acute lymphoblastic leukemia. Since then, it has grown into an international phenomena where people (not just gamers, but people) from all over the world have come together to donate time and money to help raise over $30 million (yes, THIRTY MILLION DOLLARS) for the Childrens' Miracle Network! For more information about Extra Life, you can click here. 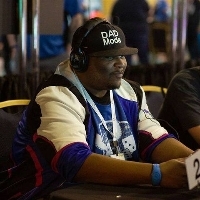 I've been participating in Extra Life since 2010 when I heard about it from the GameEnthus Podcast. Extra Life, at first, was an excuse for me to play videogames and not feel guilty about doing so. I felt it as a challenge to stay up for 24 hours to play videogames. Over the years, I became more involved and started to understand what it was I was actually doing (or supposed to be doing). Since then, I personally have raised $5600 over the 8 years I've been doing this having raised $1200 last year. I found out that Duke Childrens' Hospital (the CMN Hospital I play for) in 2014 has treated 66,000 kids and that money raised went to help facilitate some of the treatment along with the entertainment that the kids get to enjoy while they are staying which is an average of about 10 days. This year, we're kicking it up a notch! As some of you may know, I have a two year old son name Kaiden. Before we were able to meet him, we were told Tiffany was to have a C-section to get him out because Tiffany came down with an bacterial infection and there was a possibility that it could spread to Kaiden. He was born at 5:29am and I was briefly able to see him before he was whisked away. Tiffany barely got to see him because she was still a bit loopy from the surgery. They took him off to Neonatal Intensive Care Unit (NICU) where they were treated him for not only a possible infection, but an highly irregular breathing rate. Luckily for all of us, both turned out okay. There was no infection and his breathing stabilized. But that isn't the story. The story was what I was able to observe while with my son during those two days in the NICU. I had the opportunity to see all the other children, mostly premature, who had been born and had been spending the first days, weeks, and possibly months of their lives in that hospital. How they were no bigger than the Samsung Galaxy S8 you have sitting in your pocket. I later found out at a convention from a father who's daughter was also in the NICU. They pair up children based on conditions. For a lack of a better term, they'll put a big baby near a small baby. This is to help the nurses care for both by having a child who may not need as much care next to one that would need more so as to not overwhelm the staff. My son was the big baby so I then understood why I saw such a small child next Kaiden. He then shared that his daughter, unfortunately, the small one. He told me that they were in the hospital for some time and still had to leave without their daughter. Now, she's healthy and at home with her parents. Also, I wasn't able to attend or participant in any of the big game day events last year. Kaiden had become very sick at 2 months old and we rushed him to the ER. I have never seen a spinal tap performed and it was hard to watch my first one being performed on an infant. They do this so they can understand what's wrong with children that have not yet had their shots (he was supposed to get his the following week). After that, they admitted him to the hospital and took us up to the children's wing. 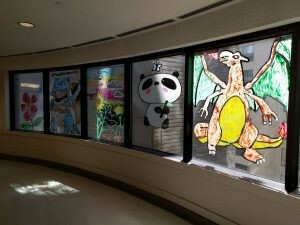 There, the whole wing was decorated with photos of cartoon and video game characters. The doors to the rooms had pictures drawn on them and little white boards with inspiring messages. In the rooms, they had PS4s for the older kids (or for younger kids to watch movies). There were waiting rooms for parents and families where you could work, wash clothes and even catch a nap if you needed to. There was even a play area for siblings. It was at these moments I realized that Extra Life has become more than "This is the right thing to do". I knew that I was raising funds for these children, their parents, and their families who go through so much. As a new parent, I'm only beginning on a journey that has already changed my life and has given me such a new outlook on life. So, who's with me?! I think we can do this! You can help out by going to my Extra Life donation page. You can share this on the social networks of your choice and reach out to other family and friends! If you would like know more about Extra Life, you can visit their about page. From there, you can sign up to participate on the big day on November 2nd, 2019! If you would like to talk to the participants and get more information from the community, I recommend that you go to the Official Extra Life Community Site and you can find me there under MajorLinux, of course! Again, thank you for listening, thank you for your time, most of all, thank you for your support.